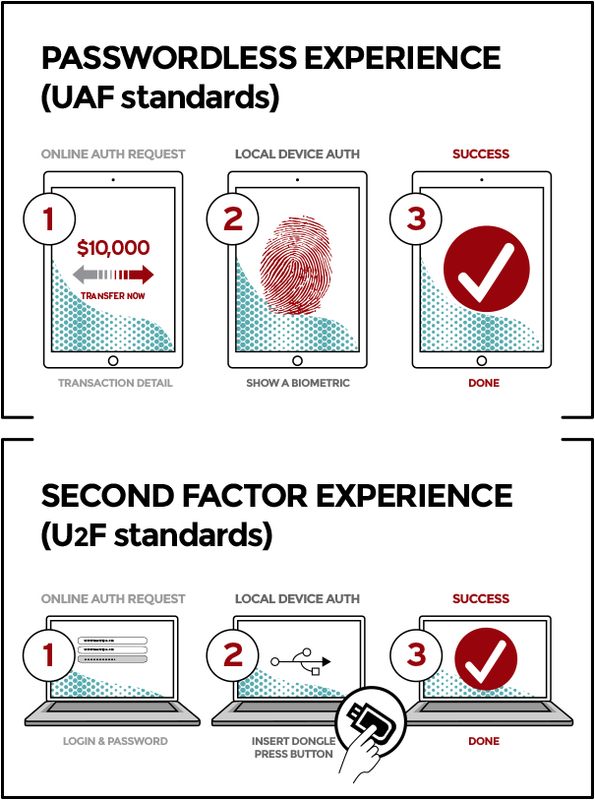 As you may already be aware, the Universal 2nd Factor (U2F) standard is a standard for 2nd-factor authentication which allows users to authenticate to web applications using a USB hardware token. With this in mind, why is U2F even a separate standard from UAF in the first place? What's so different about U2F that warrants it being an entirely different standard rather than just another authentication mechanism for UAF? From a technical point of view, your question totally makes sens. In short, UAF will have a role as a single factor authentication. That is mainly achieved by biometrics in order to replace passwords, to replace "what you know" with "who you are," in addition to some crypto techniques like PKI. U2F still has a role as a second-factor ("what you have") in addition to username/password ("what you know"). This property makes UAF completely different from U2F; that's why there are two standards. On the other hand, UAF has more operations than U2F which makes it more complex. Not the answer you're looking for? Browse other questions tagged authentication multi-factor fido u2f or ask your own question. How should I implement FIDO UAF architecture? Are there alternatives to SASL?